Saturday May 10th, 1:00 PM to 10:00 PM. Choose from literally hundreds of craft, specialty and imported beers and wines from around the world to sample. 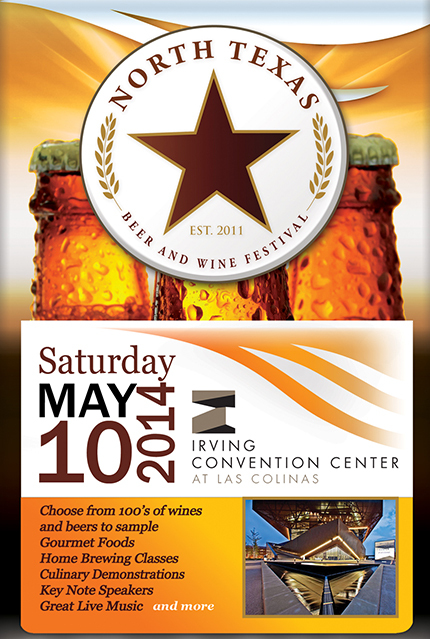 The event features home brewing classes, a chef stage, always a crowd favorite. Featuring John Franke from Whiskey Cake Kitchen and Bar, Grant Morgan from The Ranch in Las Colinas and Josh Garcia from the Velvet Taco. There will be keynote speakers throughout the day. And my personal favorite, an open air beer garden with live music! With a host of Gourmet food vendors, many talented local artists and vendors of all kinds this is one of the best events this year. There is something for everyone. The backdrop to this feast for your taste buds is the smooth sounds of The Superkings. This Blues band will get your day started out just right. On to the divine Maylee Thomas Band, they will rock you with a mix of gospel-based blues you won’t soon forget. To top off an already awesome day the VIP Event and Performance by Ashmore, described as the perfect mix of the British and Southern roots that once made rock ‘n roll great. The primary charity for the North Texas Beer and Wine Festival is Honor Flight DFW www.honorflightdfw.org; they are a non-profit organization created to honor America’s veterans living in the North Texas area for their service and sacrifices. The all-volunteer group takes veterans to Washington, D.C., for a once-in-a-lifetime, all-expenses-paid trip to WWII Memorial and Arlington National Cemetery. To date, Honor Flight DFW has flown over 600 WWII veterans to Washington, DC. I invite you to please go to their website and check out this wonderful charity. There are several ways you can get involved a make a difference in the lives of these veterans.